Just accept this fact: If a sweet recipe calls for melted butter....you can be pretty certain that I'll ending up browning it. As long as we've all agreed to this, we can carry on being friends. Glad we had this talk. So yeah. 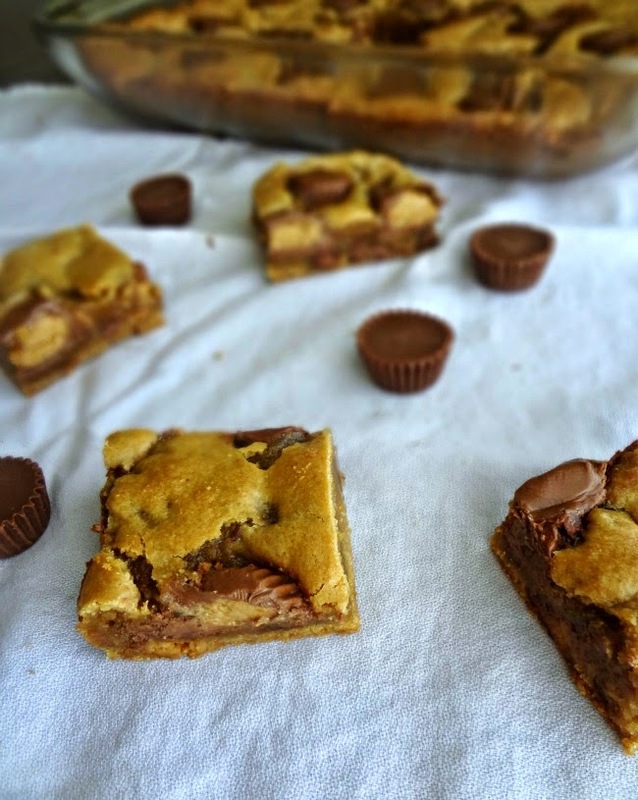 These peanut butter cup blondies looked great to begin with, and they're only made better by browning that butter! The texture is lovely-chewy and soft yet sturdy. Then you have the mellow peanut butter punctuated by dashes of rich peanut butter cup bites. And the added complexity of the browned butter adds just that little extra special something. I made these lovelies to take to my grandma's for her 4th of July pool party. Did they go over well? My cousin Christian (who is 16) ate at least 3 and kept saying, "Kayle...THESE ARE SO GOOD. ", his little sister, my cousin Brianna, ate 1 (even though she's "sensitive to peanut butter" ! She insisted it was worth it) my brother ate 2 and 1/2, my cousin's husband ate about 2, and I don't even know who all ate what else, all I know is they were gone pretty darned quick. My Aunt complained that I should have cut them into smaller pieces because they were so rich! Josh (my bro) and I agree that we think she's crazy but hey, to each their own. Perhaps you should be the judge? 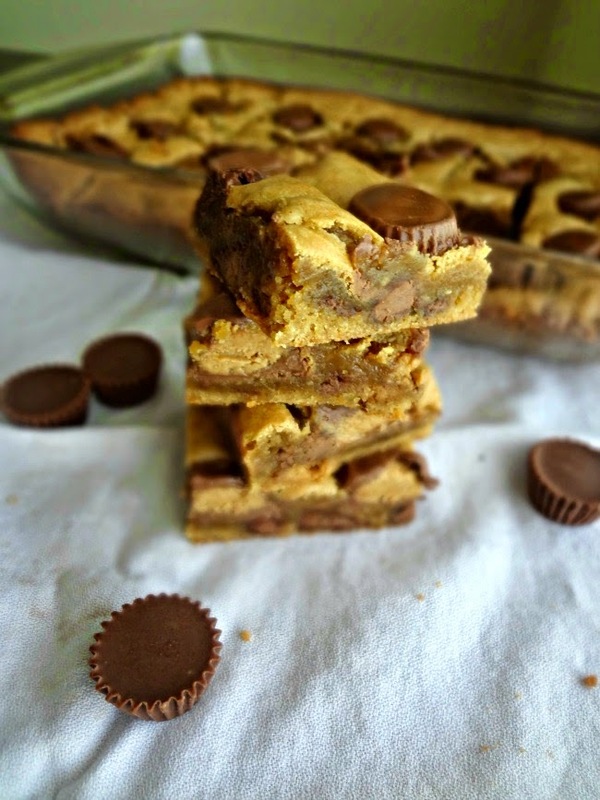 Adapted from Buns in My Oven's "Peanut Butter Brownies"
Preheat oven to 350F degrees. Grease a 9"x13" baking dish. To brown the butter: In a, preferably light colored, saucepan melt butter over medium heat, whisking constantly as it foams, bubbles, and eventually turns amber and little brown bits form. Scrape all of the browned butter and bits into a large, heatproof, bowl. Let cool for 5 minutes. Add the sugar, peanut butter, vanilla, and eggs to the slightly cooled butter and beat together until thoroughly combined. 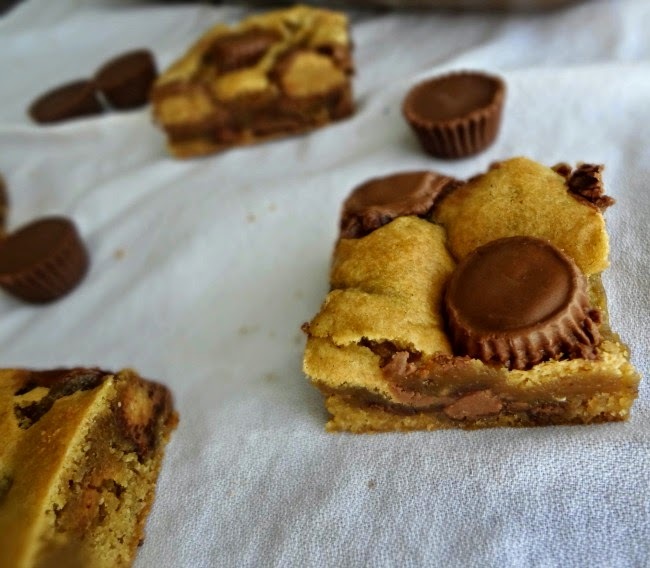 Cut 12 peanut butter cups into quarters and, with the chocolate chips, stir into the blondie batter. Evenly spread the batter into the prepared baking dish and bake 25-30 minutes, until a tester inserted into the center comes out pretty clean. Remove from oven and immediately press remaining peanut butter cups into the tops of the brownies (even rows are nice but you can also get crazy if you want!). Cool completely before cutting and serving. Store leftovers in an airtight container. 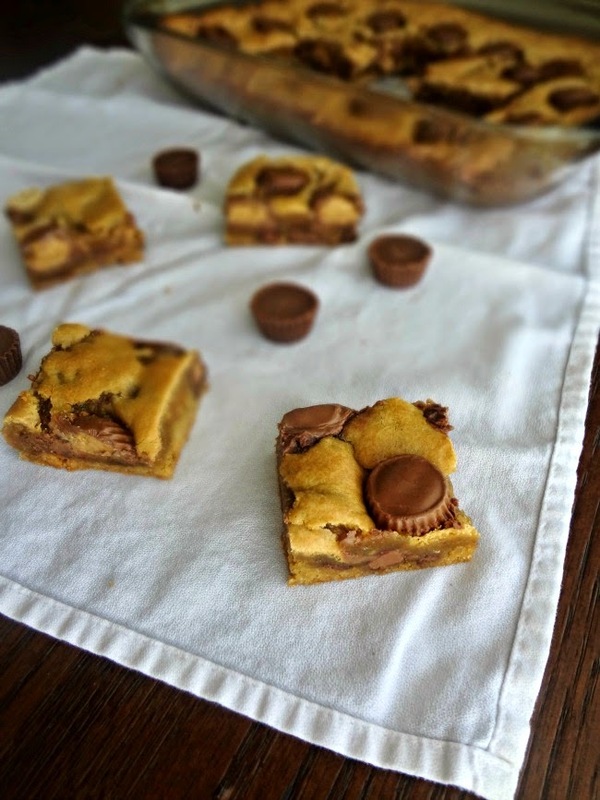 Sweet and rich and peanut-buttery goodness!